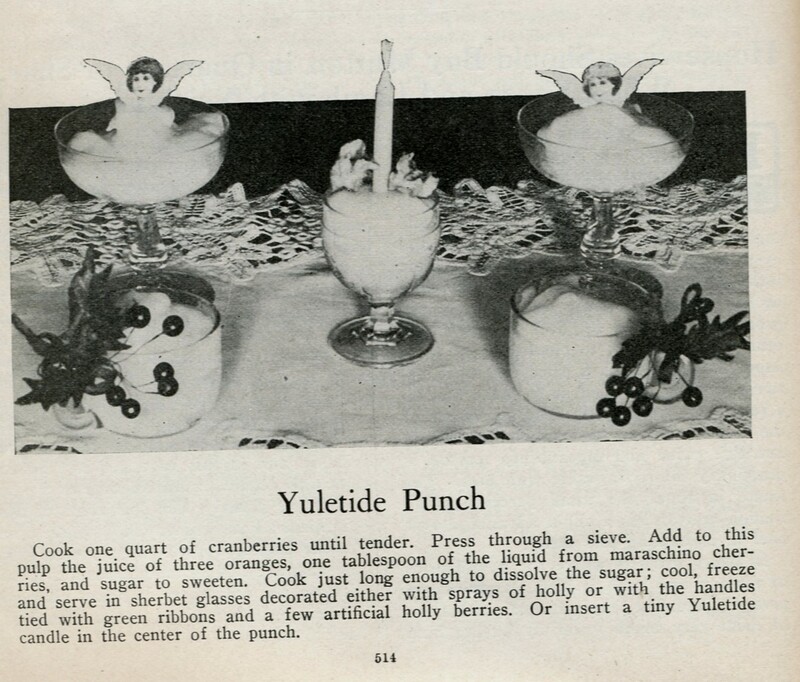 When browsing through a hundred-year-old National Food Magazine, I was amazed to see a recipe for Yuletide Punch that looked like a cranberry slush recipe to me. Of course, I had to try it. The slush contained freshly made cranberry juice (not the over-filtered store-bought stuff) and orange juice as well as a little maraschino cherry juice. The icy, dusky pink slush was refreshing and had just the right amount of tartness. This recipe is a keeper. The slush was easy to make, beautiful, and tasted awesome. I’ll definitely make it again. Combine the cranberries, sugar, and water in a large sauce pan. Bring to a boil, then reduce heat and simmer until the cranberries burst and are soft. Remove from heat. Use a strainer to separate the juice from the berries. * Squeeze the oranges, and strain the orange juice. Combine cranberry juice, orange juice, and maraschino cherry liquid. Put the juice mixture in a freezer container and freeze. To serve: Remove container from freezer 1/2 – 1 hr. prior to serving and allow the mixture to soften for easy serving. 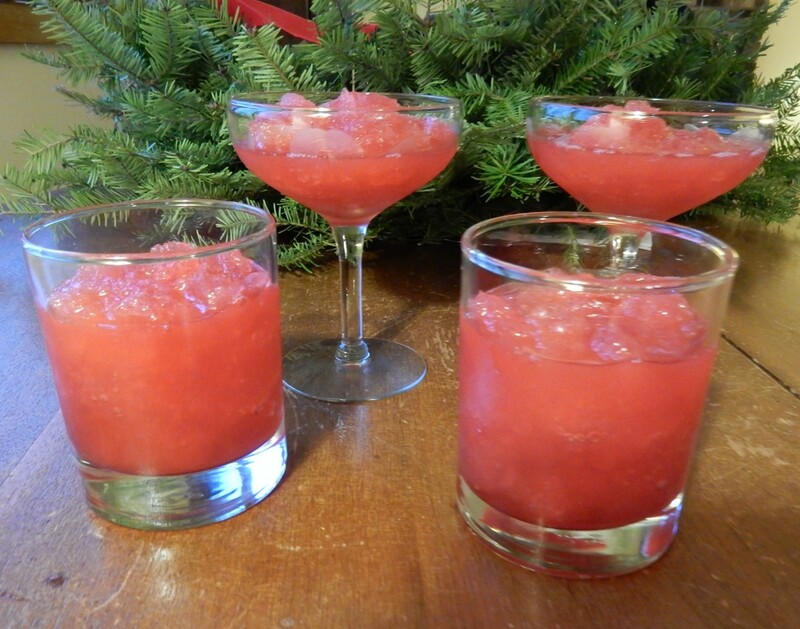 Spoon the slush into glasses, and serve immediately. *Note: The cooked cranberries are not used in this recipe, but can be cooled and served separately. Something doesn’t seem quite right with the old photo. The slush in the picture looks white. My slush was a dark pink. Posted on December 18, 2015 December 18, 2015 by SherylPosted in FoodTagged cranberry, recipe. Looks very pretty, and sounds delicious! Perfect for the holidays! Would be perfect for our summer time Christmas; may have to find a substitute for cranberries though, unless I can find some frozen ones. When I made it, I also thought that it would be a perfect summer drink–then I remembered that I never see fresh cranberries in the summer. If you substitute another fruit, you’ll have to let us know how it turns out. hmm. . . It won’t be nearly as tart as cranberries but it still should be very tasty. I think your version looks more refreshing, but I do like the angels swizzlesticks in the magazine. The candle? Not so much. That is a really fresh recipe. Now I know how to make cranberry juice. It was really easy to make the cranberry juice. I was picturing a juicer and wondered how that would work, but now I know you boil it. It’s good to learn something new. Yes, the cranberries are boiled in this recipe to get the juice. Now you’ve made me curious. I wonder how different raw cranberry juice made with a juicer tastes compared to juice made by cooking the berries. A future experiment??? I like that you post both the modern and original recipes. I wonder if when taking the photo in 1914, they only used ice in the glasses because you’re right, it looks too white. I recently decided to try posting both the old and modern versions of the recipes. It’s nice to hear that you like seeing them both. You might be right about the use of ice in the glasses. I think the color of the slush in the old photo’s just a result of the black and white photography. It’s interesting that it’s a cranberry/orange recipe. That combination shows up everywhere: in my favorite raw cranberry relish, in muffins, etc., and it’s a good one. I do agree that the candle stuck in the slush is a bit much. I suppose they thought if it works in birthday cupcakes, it would work here. Cranberries and oranges complement each other nicely when combined in a recipe. I hadn’t thought about it until you said it, but it makes sense that the candle in the slush is not that different from a birthday candle in a cupcake. Oh this sounds delicious! I might try it for Yule! It’s a very nice slushy drink. I think that you’d like it. 🙂 The more the merrier. Am I the only one wondering if a little splash of vodka would make this even better? So nice and easy and festive, would be great for a kids party too. It would be perfect for a kids party. I like how easy it was to make. I love the way they decorated the glasses with angels. I think that you’ll really enjoy this drink. Slushes are fairly popular in the U.S (especially during the summer months). I actually was surprised to see a slush recipe in the old magazine, even though it had a different name. I don’t think that many people had freezers a hundred years ago. I’m guessing that they might have just set the mixture outside to freeze during the winter months back then. It’s odd that the slushes are white in the original photo. I would think with cranberries and orange juice, they’d be the color your are. I wonder if they just left out the fruit for the photo, thinking that the white drinks would show up better in the black and white photo? It’s a mystery! But yours look delicious, and I love the decorations in the original photo! I hadn’t thought of that. You might be right that they considered it more important maximize the contrast in the B&W photo, than to accurately portray what the drink looked like. The technology available back then put a lot of constraints on photographers. Oh, yum! I will file this one away for future use. I love that it uses fresh cranberries. I also like this it could be turned into something “adult” quite easily, but unadorned would be perfect for kids too. It is nice the how this recipe can be easily adapted. A hundred years ago, it was just before the beginning of prohibition (prohibition began in 1920). The temperance movement was very strong at that time, and I’ve only seen a few recipes from the 1910’s that call for alcohol. I wonder if alcohol would interfere with the freezing. I’m guessing that it would freeze, but would be less firm than the non-alcoholic version and won’t need to be taken out of the freezer very far ahead of serving to soften. I think that I’ve seen make-ahead freezer margarita recipes where the alcohol is added before freezing. We served something very similar when I worked in a cafeteria. Kids would often order “fruit punch”, which we didn’t carry, so we’d tell them,”We don’t have fruit punch, but I can make you something similar. We call it an “Island Punch”; it has cranberry juice and orange juice. If you don’t like it, we’ll bring you something else.” They never did dislike it; in fact, the kids absolutely loved it, and would often ask for seconds. On a relatednote, you can get an Island Punch in many bars, if you know to ask. I wouldn’t doubt one bit if someone stumbled upon a recipe like yours, and thought,”Hey, that sounds like a good idea. I’ll tell the boss and maybe we can invent a new drink.” Of course, yours is made with much fresher ingredients. Interesting observations. . . .
How divine, Sheryl. Thanks soooooooooooooo much. It is a wonderful drink! Good things stay forever! Thanks for sharing! It looks like an absolute thirst quencher! thanks for sharing!!!! In addition to serving it over the holidays, it would be perfect on a hot summer day. Unfortunately, I don’t think that fresh cranberries are generally available in the summer. Sheryl this does look like a keeper!!! It’s definitely a keeper. This drink is really good, as well as easy to make. This drink is wonderful!! Served with cheese, bologna and crackers. It’s makes the layout attractive and delicious. Thank you! I also tried it with agave syrup ,one wouldn’t know the difference from sugar . It’s wonderful to hear that you enjoyed this recipe. It sounds like a lovely spread of food. It’s good to know that the recipe also works well with agave syrup.